Field Drums (a/k/a Field of Drums): Is This a Confederate Civil War Drum? Is This a Confederate Civil War Drum? Please take a look at the attached photo. It is a display piece including the drum (marked DEO VINDICE[*] and C S A in a circular "logo" on the side. Has leather "tighteners". There are faint pencil inscriptions on the drum head, hard to make out. A name and unit perhaps. It looks old and someone put this display together as a commemorative but hard to date it. There is what appears to be a British pre-war sword, drumsticks, and old fife, etc. I am most interested in the drum. This is at a local auction house and the consignor does have some very old items (i.e. 1880's sewing machine, musical instruments). 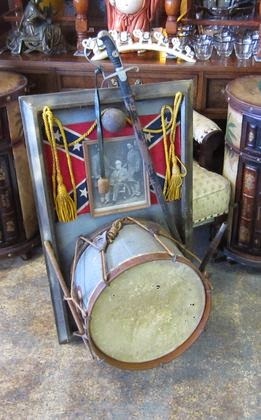 I am wondering how likely it is that a genuine confederate drum is "laying around" in this display piece. Any insight is welcome. Thanks. * Deo Vindice (English: Under God, our Vindicator), was the motto of the Confederate States of America (CSA), and was engraved on its official seal.